I haven’t been around the blogosphere for several months now, but I promise I have a good reason for it! After the Capture Your Grief challenge, I found that I needed a little blogging break. Meditating on grief every day is a really emotionally trying exercise. Then, I got some news that made blogging in general…complicated. 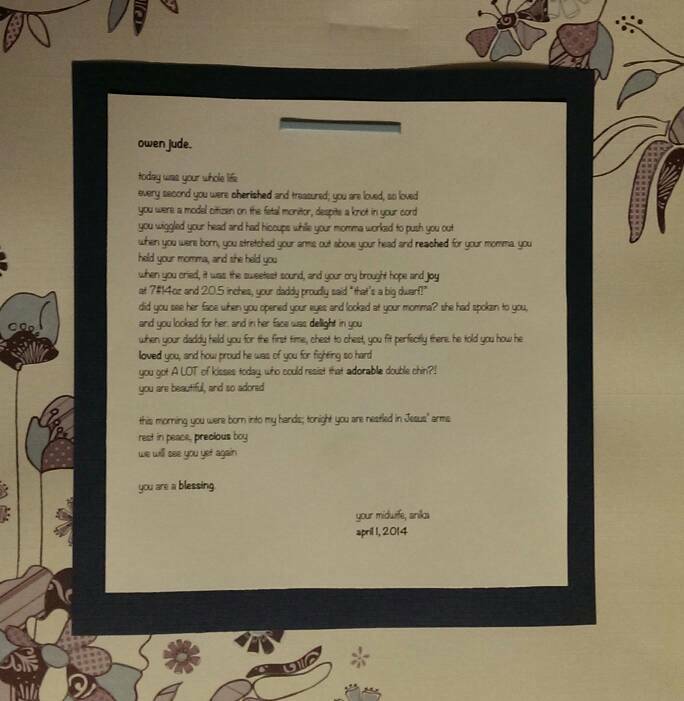 I’m going to put a *TRIGGER* warning for other loss moms reading because I think I would want one. I’m about to write about a new pregnancy and a new baby. So if that’s not a spoiler, I don’t know what is. Zach and I are expecting a new baby boy in August 2015! We are thrilled (!!! ), but the first few months were quite full of fear. As I’ve written in the past, becoming pregnant poses a substantial risk of more loss. There was no way for us to tell until about 12-13 weeks how this pregnancy was going to turn out. Of course, even now at 16 weeks pregnant, there are no guarantees. We are very hopeful for this baby, but we are no strangers to loss. We were fortunate that we know the genetic mutations that Owen inherited from us, so we were able to test for them very early on. I underwent chorionic villus sampling (CVS) at 11 weeks so we could look for those mutations in this baby. 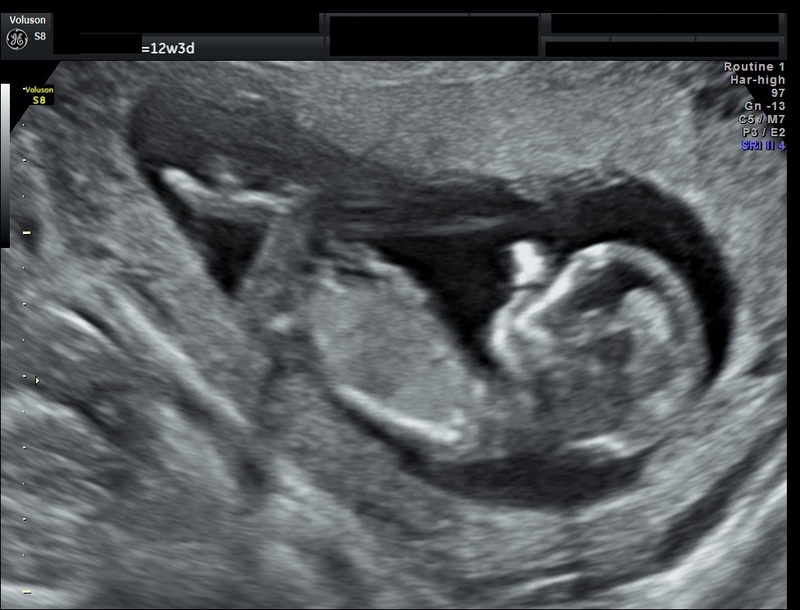 While we waited for results, we had two very promising ultrasounds showing normal length long bones and hands with only 5 digits each. Since Owen’s long bones and hands were pretty clearly atypical early on, that gave us some relief. We got our final results at 13.5 weeks which told us this baby is free of EvC! He is a carrier, like us, which should not affect him in any way. One of my midwives wrote this just a few hours after she delivered Owen. 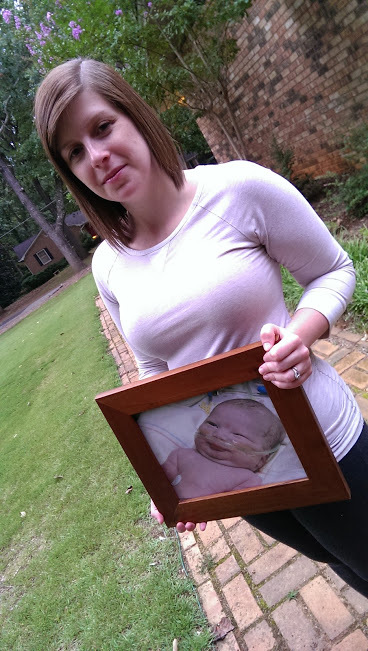 She brought it to us, along with flowers and postpartum supplies for me, the day after we got home from the hospital. When I saw the date, I realized she had gone home from a very long, emotionally difficult shift with me (I think 24 hours?) and devoted even more time to our grieving family by writing a poem to my son. It is one of the most beautiful things anyone has ever done for me. I’m not sure she realizes it, but by putting this on paper, she also helped me to have a reminder of Owen’s most special moments–I had no idea Owen reached for me as I reached for him, for instance. There aren’t many people in my life who had a tangible relationship with Owen. Many people know him through Zach and I, of course, and experienced his life before birth, but relatively few people ever met him. It’s pretty much just me, Zach, Anika, our parents, and some very close friends. We had a few nurses who I know were impacted by us, and I know they remember Owen, which means so much to me. There’s something special to me about knowing that Anika loved Owen and saw how special he was. I am so glad that the first hands that held him belonged to someone who could appreciate his beautiful, short life. I’m thankful for the relationships I’ve formed with my midwives through my pregnancy and Owen’s life and death. Babyloss isn’t easy, but it is surely more bearable when there are other women there to support you. I am even more thankful for the relationship my midwives formed with my son. They protected our time with him and helped to honor his life, no matter how brief it was. The spring brings Owen’s birth and death to mind, but I associate fall and winter with him the most. When we went into the hospital, the weather was still cool and showing no signs of spring. When we left the hospital without Owen, it was beautiful, sunny, and warm. I told Zach on the way home that it felt like Owen had brought the spring to us. I suppose that also means to took the winter with him. Chill reminds me of Owen’s life with us: bundling myself up and not being able to find a coat to cover my belly as fall turned to winter, traipsing all over for appointments with specialists on icy roads, hibernating with him during our January snowstorm. We took a beach trip when I was 14 weeks pregnant to celebrate the last bit of warmth. Two weeks later, fall had fully hit with changing leaves and cooler temperatures, and we were being told that Owen (who we had just recently named and felt move) was going to die. Winter came, and we got good news. Owen might live. Winter is the only hopeful time I got to experience with Owen. It’s the only season we spent planning for his life rather than his death. I wrote his name in the snow during the snowstorm so that if he lived, I could show him that we had been loving him and planning for him since before he was born, that he was a part of our family even before birth. October is Pregnancy and Infant Loss Awareness Month. I was vaguely aware of this prior to losing Owen since I worked in a NICU and talked to a handful of moms there who participated in various events. Now it’s my turn, I guess. I’ve decided to participate in the CarlyMarie Capture Your Grief Photo Challenge. Hopefully I’ll be able to keep up. I’m already behind by one day, so let’s just pretend I posted this yesterday! My sunrise photo isn’t quite sunrise. 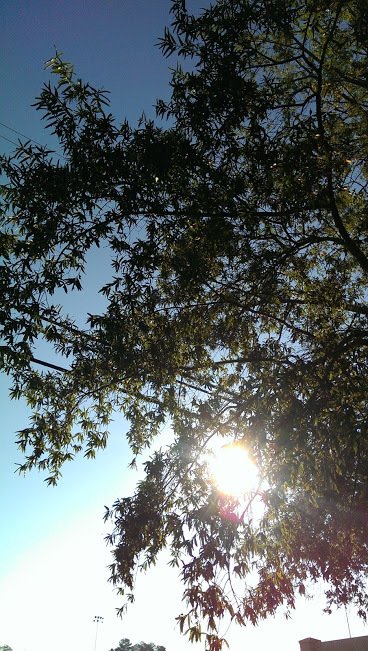 I took it at my clinic after being at work for about an hour, but it’s a wonderful image of the sun coming through a really beautiful tree outside of my window so I’m going with it. Plus, I’m not a get up at sunrise kind of girl. Sunrise is a time that is dear to me though. When Owen was dying, we were wheeled out of the the NICU (he was in my arms) and into a Labor & Delivery room with a wonderful view outside. The sun was rising over the hospital, and I was so happy that Owen got to experience sunlight. I haven’t been up at sunrise since that time. For the first month after he died, I would set my alarm for 3:08 am (the time of his birth) and go sit with his ashes and meditate on his life, but I never really felt compelled to reawaken at the time of his death. Because I associate Owen’s death with sunrise, I always feel like he is here with me a little more when I feel the sun warming my skin. I’m inspired by Meghan at Expecting the Unexpected today. Some of you may have seen the series of photos that seem to have gotten popular lately of women before and after having their babies. The first photo is usually a maternity photo with a big, pregnant belly, and the second photo is the same as the first, but re-staged with the baby where the belly was months prior. To most people, these pictures are adorable. Brutal honesty: I resent the hell out of these pictures. I don’t ever seek them out, but they pop up in my newsfeed on facebook or in random places around the internet from time to time. Sometimes I wonder if feeling bitter at these types of things is something I should work on, but that’s an issue for my therapist and future me to work on. Meghan made her own set of before and after photos as a baby loss mama and issued a challenge of sorts for others to do the same. 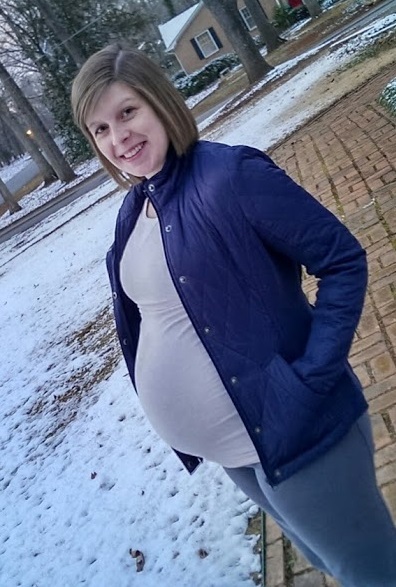 I had maternity photos taken while I was pregnant, but I was so darn excited about this that I used a cell phone picture Zach took during the Georgia snowpocalypse and recreated it when I got home from work last night, so forgive the cell phoney quality. I may recreate my maternity photos later on because I think it would be neat to have ones with Zach included, especially the ones where he’s holding Owen’s little dinosaur shoes on my belly. Putting on my old maternity clothes was not as emotional as I thought it would be, but looking at that old picture was. During all of this snow, I remember talking to Owen about it–how fun snow in Georgia is, how it shuts the whole city down. 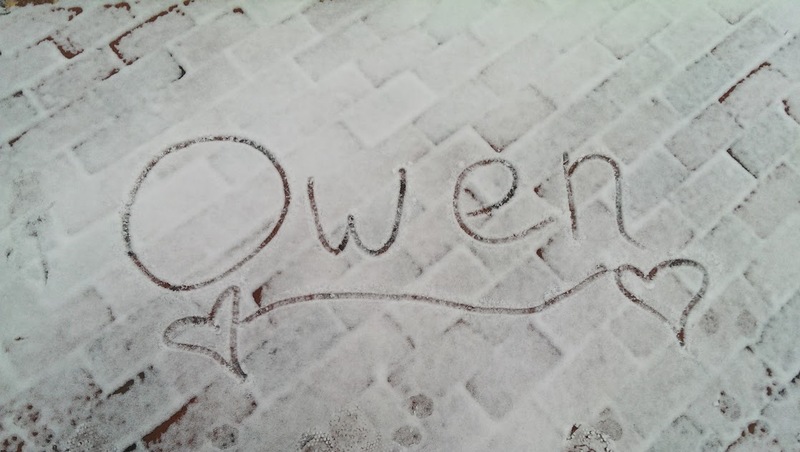 I wrote his name in the snow and took a picture, thinking that if he lived I could show him he had gotten to enjoy the snow in-utero and if he died, well…I had proof that we had always included him, always loved him. I loved recreating this picture. While I haven’t seen very many of the slide shows Meghan linked to on her blog yesterday, I had assumed that some of them included empty-armed mothers like us. Surely, there was some acknowledgement that there are women who carry their children but don’t bring them home. Apparently, there wasn’t, so here’s to us.